A RUDN mathematician has developed a solution for a perturbed differential containment—a generalized case of a differential equation. The development will calculate optimal paths for the movement of a crowd or a flow of cars. It may also be used to manage robotic cars and multi-agent robotic systems. The results of the study were published in the Journal of Differential Equations. The majority of physical processes can be described using differential equations. To do so, an unknown quantity (e.g. temperature or velocity) is presented as a function. A differential equation may be written for such a function, and its solution will describe the behavior of the unknown quantity. However, in some cases writing a differential equation is impossible, and mathematicians have to use so-called differential containments—equations in which the equal sign is replaced with the sign of containment or inclusion. 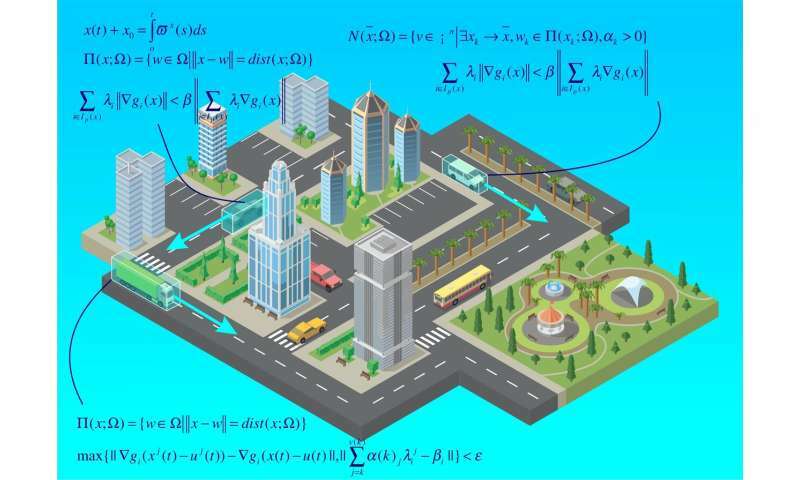 A RUDN mathematician developed a comprehensive solution for a group of differential containments and showed its possible applications in city management cases. Optimal control problems are covered by a special theory in mathematics. The idea of such problems lies in developing (quantitatively or theoretically) a control law that would bring a system to a certain given state in the most efficient way. Imagine a car that is approaching traffic lights. When the distance between them is 250 meters, the light turns green and remains for 30 seconds. The control problem is calculating how the car should move to reduce its energy consumption to the minimum. At first, this may appear simple, but note that both acceleration and slowdown consume the fuel. Therefore, such a problem lies in the scope of the optimal control theory and can be solved using a differential containment. "Besides pure theoretical interest, the motivation for this study was a complicated task that required optimal control with internal limitations. In practice, it may be expressed as the description of a crowd in a plane," said Boris Mordukhovich, a co-author of the work, and an associate of Nikolsky Institute of Mathematics, RUDN. The differential containment in question can describe the movement of a crowd. Imagine there are a lot of people in a room, and each of them needs to leave it as quickly as possible. However, there is only one exit. The results obtained by the mathematicians will calculate the trajectory and speed of movement for each particular person. The results of the study may be practically applied to the calculation of optimal routes for robotic cars. Another possible area of application is multi-agent robotic systems, i.e. systems of several AI robots working on the same task, such as sorting or transportation of goods. Several robots of this kind form a crowd, and for their work to be efficient, optimal speeds and trajectories should be calculated for each of them. Is sin(##x^3##) odd or even? An interesting series - what does it converge to?